Do you enjoy golf? When you live in the Golf Capital of the World, you pretty much have to love golf! 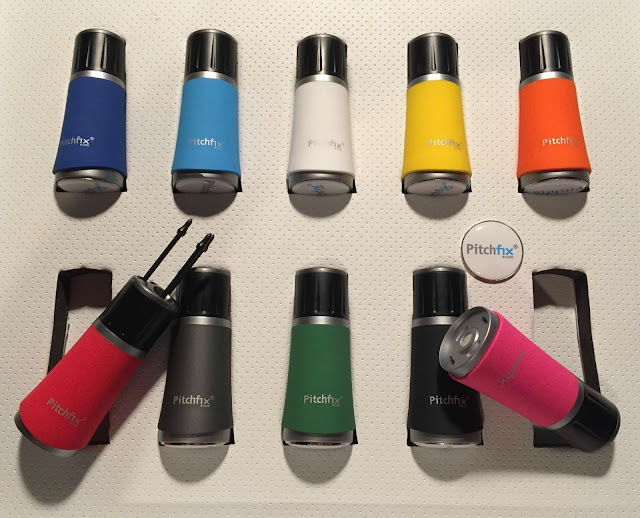 Pitchfix touts itself as the "World's Best Customizable Golf Products." Pitchfix offers a wide range of high-quality golf products that can be personalized or customized with your company or event logo. First, let's talk about the "AlignMee" ball aligner tool. If you struggle with putting as much as my husband does you know the importance of picking the correct putting line. The AlignMee tool allows you to quickly and accurately add an alignment line to any golf ball so that you can line up those tricky putts. AlignMee offers a clip at the top so that you can clip it right to the outside of your golf bag for easy access. It also offers a built in pen for marking the line. And, as with all of the Pitchfix line of products, it offers a large customizable area for your course, company, or event logo. The AlignMee comes in 6 vibrant colors. No matter how many strokes it takes to get to the green you'll need a ball marker once you get there. Sure you could just use an old coin or whatever cheap plastic marker you found lying around. But why do that when you can use a stylish ball marker adorned with your company logo that clips right to your hat? The Pitchfix Hatclip comes in 10 colors and is made of titaniumized stainless steel, making it strong, lightweight, and rust resistant. The topside is rubberized and can be customized with your logo. The best part is that it clips right to your hat so you don't have to fumble around in your pockets looking for a ball marker. For you pin seekers out there that knock it stiff on a routine basis you know how important it is to repair your ball marks on the greens. It's important to know how to correctly fix a ball mark so you don't draw the ire of your greenskeepers. 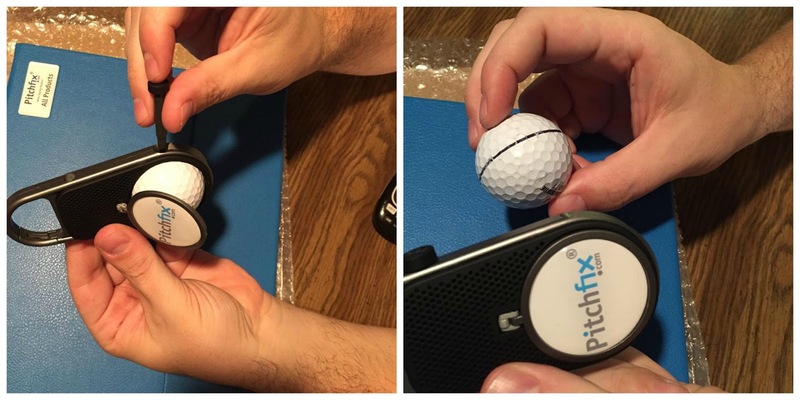 The Pitchfix Twister 2.0 is the perfect tool to ensure you fix your ball marks correctly everytime. You simply twist it open and insert the three prongs into your ball mark. Voila! Your ball marks are fixed right everytime and your greenskeepers will love you. The Twister 2.0 comes in 10 colors and features a customizable ball marker just the like the one you can find on the Pitchfix Hatclip. 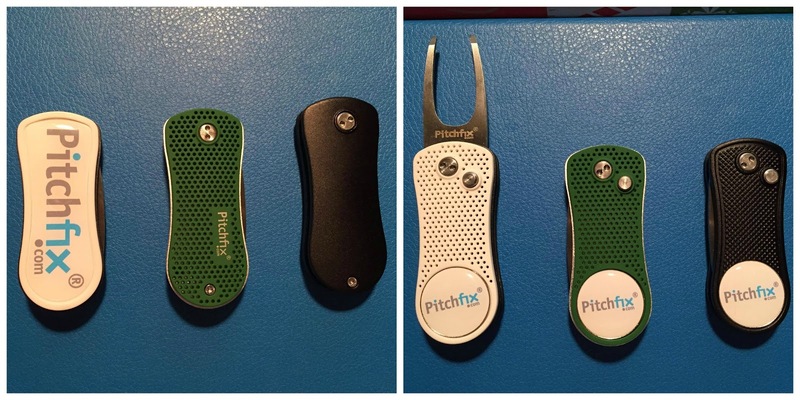 If you're more of a traditionalist, Pitchfix also has traditional divot repair tools made with a switchblade design. The Pitchfix Classic is made from aircraft aluminum and is therefore very light weight. Available in six colors the Classic also has an attached magnetic ball marker that can be customized with your logo of choice. The Pitchfix Hybrid divot tool is very much like the Classic but offers a rubberized grip and comes in 19 different color combinations. If your looking for the ultimate in customizable divot tools then the Pitchfix XL 2.0 is the one for you. Just like the Hybrid the XL 2.0 offers a rubberized grip and customizable ball marker. But the XL 2.0 takes it a step further by offering a full sized customizable rubber back that can be outfitted with a large company or event logo. 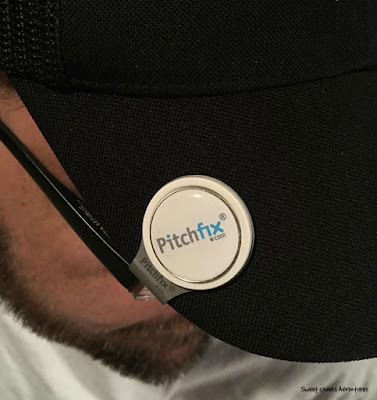 If you're looking for high-quality and useful golf products to promote your company or event you should check out Pitchfix.com. If I played golf, this looks like a really neat tool I would have to get. Great review!